I would like to tell you about another thing that excites me. without going into details, for health reasons a mom was not able to return here to see her own daughter graduate high school. Not only that, this mom had put years of her time into the youth here and this graduating class all held a special place in her heart. But she couldn't be here to see it happen. A few of us got together, and were able to setup a Skype video conference so that not only could she attend the entire graduation, virtually, but she could address them as is the tradition here. So.. imagine the scene. The meeting house is full of people the stage with the graduates, the big screen comes down, and projected on it, this woman that no one got a chance to say "bye" to because she has now left finish. All the people who wanted to see her couldn't and suddenly THERE SHE IS! The place was full of happy tears, as she addressed the graduates, he voice filling the hall. It was a modern miracle of technology for us here. It was only a short few years ago that we didn't have email. But it was one of those things that really touched and helped a huge percentage of the people here. Gave them a chance to say goodbye, helped make a horrible situation less horrible. Helped unite a mother with her daughter. THAT is the kind of thing I'm here to do. Not technology for technology's sake, but technology to further the kingdom of God... to uplift and encourage, to support. THAT was a magical night for many people, including me, and it was magical for all of you too who enable us to be here and make these things happen. (the beginning of construction for a new cell phone tower that will give signal to us and several residents in two nearby valleys). -the telephone company is a huge cash cow for the government who owns and regulates it. They opened the door briefly and through it jumped Digicel which competes against the telephone company run B-mobile. land-rights is a very difficult proposition here. Culturally a man can sell you the rights to use an acre of his land for say, a cell phone tower (a tower is what your cell phone connects to and gets it's signal from). But those rights tend to need repaying whenever the land owner needs cash. Say he sells you the land, in 5-10 years his son is grown, inherits the land, and now wants his share, only now, it's more money.. and so on and so on. If they get unhappy, they tear down whatever you put on the land. So Digicel installs these fortress like towers. 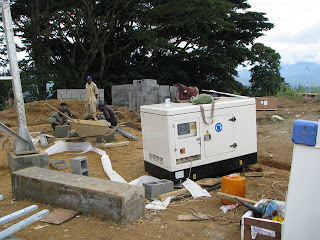 Tall cement block walls topped in razor wire, with huge generators inside in case they cut the power source. Digicel knows what they're doing, and because they can negotiate the tricky cultural swamp of land rights, they have towers all over the country now. Which means, instead of it costing me $3.00 p/minute to call home, it will cost me $0.33 cents p/minute to call home, for roadside emergencies, what have you. AND.... digicel has implemented GPRS, which means, for those smartphone owners (not many of those around here) you can get email and map information now. It means that technology that the U.S. has enjoyed for nearly ten years now, has finally begun to arrive here! And that means communication is more affordable. AND that also means translation data will flow. Scenario A: the translator takes his laptop, goes to his village, spends 2 months recording audio data, and typing in books from the Gospel. He has no way to backup or email his data, so he takes his laptop back to our centre to store it on servers and send it back to the U.S. for processing. Only on the way, he's held up, and they steal his laptop. 2 months of work gone. This is a SAD scenario and has happened more than once. Or say not held up but the canoe tips over, his laptop falls to the bottom of the sea. This has happened. Scenario B: they do their work, they email it off, it's stored instantly and safe. No work lost!!! YAY! This is why I get excited about technology. Not because it means I can do new (well old to me) and exciting things, but because it has a real life application that furthers the spread of the Word. 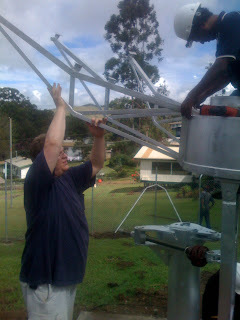 helping to put together our new VSAT (satellite internet) dish. I was the only one who didn't need a ladder! I'm pretty excited about this, because it reduces the cost of our internet usage by about 25% in the long run. Which means I can upload more pictures for the same price, or the same for less money! Also it means that our internet connection won't go down during the (near daily) rain storms we have. It has been a lot of work setting up routing and testing the connection and working with our new Hong Kong based ISP to get things set up how we like them, but after 1 month of tweeking and working, TODAY we saw the best performance we have yet. We're growingly happy with the new technology, and it's a huge win for everyone who lives and works here. We will hopefully go LIVE with it very soon. I find it difficult to explain many aspects of living here in a way that you can truly understand them if you haven't spent time here. Needless to say, making this place your home requires sacrifices and tensions that build over time to the point where you do need to take your family and escape for a brief time. One of those tensions is always being watched. People looking in your windows, watching your every move, almost as if you were the circus come to town. So we decided we needed a break. We drove 5 hours across some nice, some not so nice roads to get to Madang. A dirty little town with some gorgeous beaches nearby. We stayed in guest house and accomplished the one thing I've wanted to do for a while now. We got a boat and went to a secluded island, no one around for miles, to watch, stare, giggle. No one but us and white sand! It was a perfect couple of days. We had a wild parrot join us for lunch. We had white sand and perfect water. We saw poisonous creatures in the water and promptly exited the water. We snorkeled and swam in perfectly clear and warm water. We adventured and found parts of the country we'd never been too before. We found a place with actual waves. But most of all, we shed all the pressures and stresses of living here for a few days and rejuvinated ourselves and our family. Upon returning home we discovered how truly in need of a break we were. Now school break is here, and the kids don't have school. Chad is back to work and Kendal is working and preparing her class room for the next school year. Many of our friends have gone. Most forever, some for a year or so. 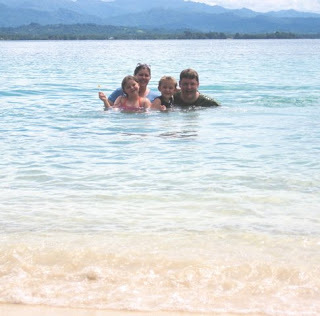 Part of the emotional strain of this loss was lifted thanks to our short trip to Madang. If anyone asks themselves "the place looks like paradise, why should they need a break?" I would simply reply "please come visit us and you will know." I gaurantee you that if you spent 3 weeks with us you would return home exhausted, (but excited)and knowing the answer to that question. We thank God for you all and pray for you daily. Thank you for enabling us to be here... even if that means taking a moment to breath in new life so that we can continue on. We are definitely not short-timers here. We are working in such a way that we can emotionally and physically be able to stay here for many years. I wanted to take a moment and talk about my wife. Living here is hard on women. I will avoid all the psychological discussions about security and safety and vulnerability and such. Those are for another time, but are very real issues for women living here. I would like to talk about the physical and practical day to day. Living here is hard on women. The modern conveniences that make running a household more efficient are lacking here. If you are a housewife, then you learn that it is hard to plan meals around a grocery supply that is unpredictable. If you do both work and take care of your home (as my wife does) then you need to learn to rely on others to get through the day and keep your home in a working order. Those "others" are nationals whom we hire as part of our community service here, and it means cultural difference and contact. What happens typically is that when a new couple arrives here they go through culture shock. The guy tends to love a lot of things here. It's beautiful, you can 4x4 and do things that get you dirty. You can go to work with holes in your socks and it's the norm. But for the ladies with kids, dirt and staying clean avoiding infection is a constant struggle. Our kid have permanent dirt under their toenails. It may sound chauvinistic, but from one very simplistic perspective, this is paradise for a guy who likes to get dirty and do hard work, and a sacrifice for women who like a tidy home. Even small things like fixtures and the niceties that make a home a home are lacking. Curtain rods? No.. we have wooden dowels, and if you can find or fashion some.. brackets to hold those dowels. There are some of the rare homes here where a lot of expense and effort have been put in to making it feel like "America". Carpet is rare, privacy is rare, clean walls and floors are rare, and you have to remember not to leave food out or the ants will get to them. Mice, ants, rat, roaches, frogs, crickets, and other creepy crawlies live in bounty here. And that is why there are ladies here who suffer more than others. Some ladies cope with these things, some thrive in it, and some suffer greatly and can't wait for a chance to leave it. My wife is one of the ones that thrive in it. She copes with those things that annoy, but mostly she thrives. This picture above is new, but quickly becoming one of my favorites. There is something about seeing your wife shine. Something spectacularly joy inspiring to seeing your wife happy and doing well. My wife has had a bad few months of physical illness and pain, but to see her at work is amazing. She loves these kids so much. Her pre-school class is filled with both ex-pats and nationals.. learning together. 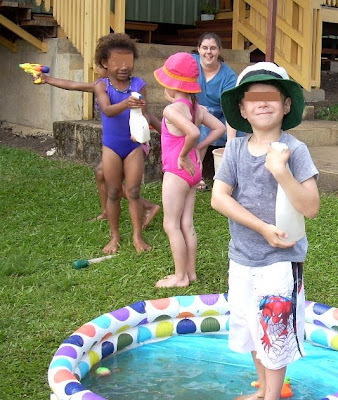 With that kind of environment, the kids thrive as well and turn out to be very decent adults. I wanted to share this picture with you, and give you an idea (not-so-briefly) because in this environment, to see a man thriving isn't so exciting. Men thrive here. But to see a woman thriving, enjoying, producing fruit, and smiling like this.... fills my heart up with so much gladness I had to share it or bust. I am aware that some people investigating moving here read my blog from time to time. So I'll add this for those of you considering coming here. The litmus test for me regarding your wife's mental health, is this; When you go on family vacation, does she prefer camping, or a hotel with room service? Everyone enjoys a hotel with room service, but I mean, does she truly enjoy camping? Each husband here needs to keep tabs on his wife, ask her how she is feeling, don't leave her alone a lot at night, make sure she is safe and happy. In a majority of cases people are perfectly happy and get along great. The little things tend do tend to build up, and so while the husband is enjoying life here he needs to remember to be attentive to his wife so that she too can enjoy life here.